News ► Unchained X Releases in Japan in September 2015! 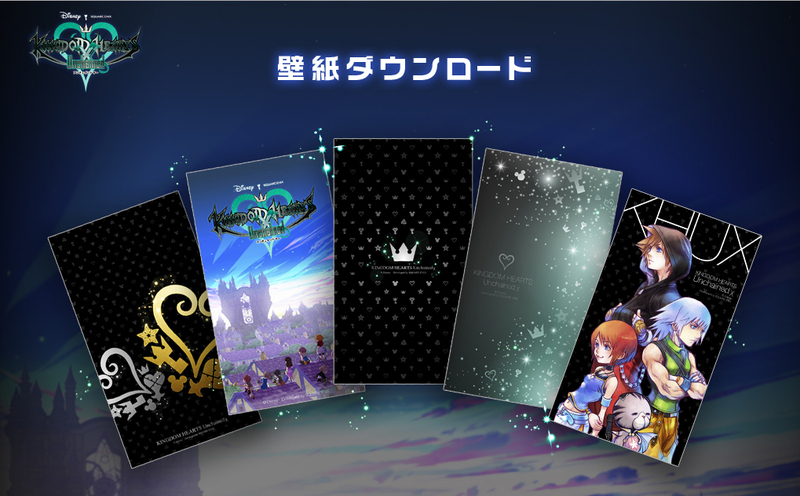 Kingdom Hearts Unchained X will be releasing in Japan next month, and to celebrate, Square Enix has released a set of wallpapers for iPhone and Android to tide us over in the meantime! To claim them, all you need to do is register for Unchained X on the official website. Simply enter in your email address, click the right button, and an email with a link to the download page will be sent to you. Alternatively, we also have a direct link to the page as well! Kingdom Hearts Unchained X will be releasing in Japan in September 2015. It is currently in development for a North American release, while a release in other territories has not yet been confirmed. Be sure to follow the official Japanese Unchained X Twitter account for updates! Completely overlooked the tiny print at the bottom confirming the release date, oops. This is so exciting. I'm sure the English release isn't far behind. And the wallpapers are really nice, too! I am not able to get it in the game, but I am really happy I can use it as a background! That's a really nice present! I really like the first and the last wallpaper. :3 Immediately downloaded and used them. Thanks for sharing! I'm really disappointed it isn't a worldwide release. If it should have been like this, priority had to be give to Europe and America, Japan has already Chi. Well, you never know. It could be a simultaneous release (for NA and Japan anyway. I don't think KHU has been announced for Europe last I checked?). They might just be waiting to announce the release date at D23 in a few weeks. Really great that a realase date is now in sight. Maybe that also means thath the realase for other continenets is also near. Also those wallpapers look really nice. Since 358/2 Days Square Enix puts these little symbols in the background of their webpages, wallpapers and sometimes even game covers that vaguely reflect some game's themes. This time the guilt symbol is present, meaning there will probably more to it after all. Anyone got any ideas how somebody (me) in Australia would be able to play the Japanese version on iOS? You'd need to make a Japanese iTunes account and log on your iOS device with that account and download it from the store. Settings, iTunes & App Store, click on your Apple ID, View Apple ID. (Can't get English to show up from here on my phone) 3rd option from the top: Country settings, change Country, choose 日本, agree the T&C, add in random Japan address, next and you are done. You can fully access Japan's store. The only issue is that you can't download non-free apps and do in-app premium purchase unless you have a JCB card or purchase a Japan iTunes gift card. Kingdom Hearts in Japanese is キングダムハーツ, so use this to search if you need. Those wallpapers are pretty snazzy. Too bad I don't have a smartphone. Can't believe it'll be out next month! Hopefully this means the NA release isn't far behind. I hope this gets a Europe release!